We’ve all been there. It’s sunday night, you can sense the busy day ahead filled with work, obligations you can’t ignore, whether you have children to take care of, volunteering to do or school work. But something else needs to be done…exercise. Now don’t get me wrong, working out is great. No matter what your sport of choice may be, you always feel so much better after completing it. What we don’t love so much is what happens during that work out, which is sweating. Now I don’t know about you but whether my hair is curly or straight, the frizz that occurs after I work out is something out of John Frieda’s nightmares! Particularly if I have straightened my naturally curly hair, you can bet that by the end of my work out, the top of my head is turning back to curls, the frizz is approaching and the fact that I have to get to work does not help. When I decide to do cardio or an intense work out at the gym, it is exactly that… Intense! I like to sweat, not only because I feel I’m getting the most from that exercise, but also because afterwards I feel really accomplished. But we shouldn’t be constantly trying to burn every last calorie we have. Our bodies need to rest, to work every muscle and to have time to heal. By making sure you mix cardio, toning and strength you also allow your hair a break! Though Yoga or even walking won’t make you burn as many calories as say running or weight training, it’s still great exercise. Why not plan your week to allow for these to be incorporated and therefore give your hair a break. This is particularly good if you want to still do something active, but may have an event later on. With the right hair products to hand, you won’t need to use them all of time, which I believe can sometimes cause more damage. I don’t enjoy when my hair is full of product so for exercise it’s no different. Of course when talking about exercise and hair, I have to mention Dry shampoo. In my gym bag, dry shampoo will always be found, because it is so amazing. 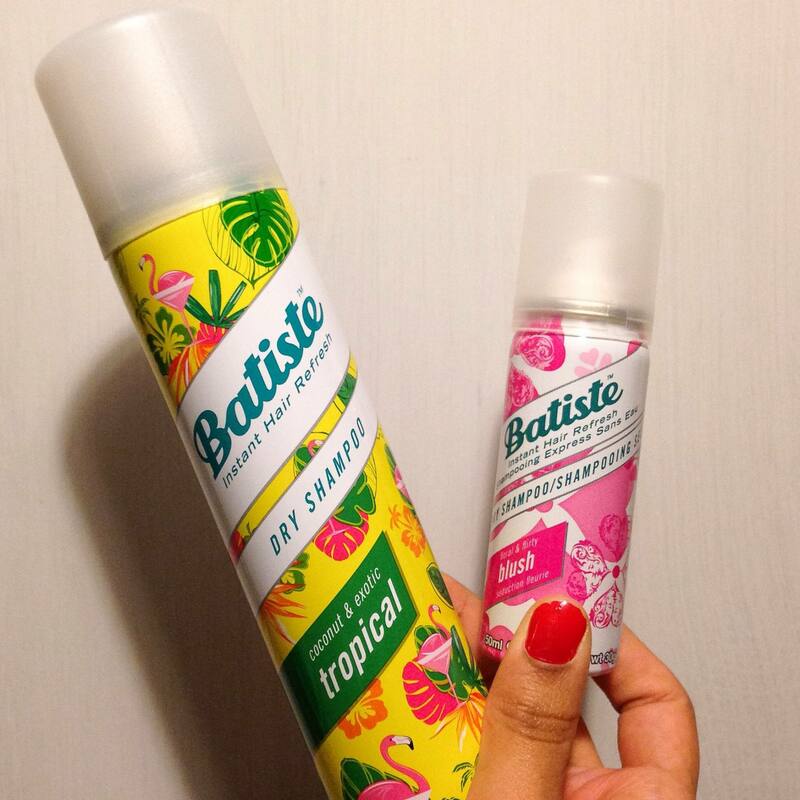 Gone are the days of throwing talcum powder in my hair, as it is now in a perfect spray can. I love that you can get travel size shampoo as well, which is perfect to keep in your handbag. Another way to manage that frizz and damage from exercise is to ensure that your hair is in good condition when you aren’t working out. You can buy some fantastic hair masks, book in for conditioning treatments or even make your own! I love coconut oil for my hair. You can use this for so many things, and using it for your hair care is ideal. Another product I have come to love are the fantastic Invisbobbles, which I have talked about previously here. These bobbles are the perfect solution for gym hair, as one of their main selling points is that they stop your hair from getting that kink that elastic bobbles cause. Genius! They are perfect for whatever way you like to wear your hair, and come in so many colour options. This is a style that can be for a more high intensity work out or a more toning focused one. A high bun is my go to hair style for the gym, not only does it keep the hair well away from your forehead as you get warmer, but it’s also a style that takes a minimum effort. When I wake up early to exercise, the last thing I want to do is focus too much on my hair. Throwing it in a bun is the perfect solution! Not usually a style you will find for many work outs, but sometimes if I am just walking, stretching or doing a very light work out, just getting my hair out of my face is enough. I do see many people going full throttle with their hair out, but for me this style is best left for moderate exercise. Another go to style for me personally is a high pony tail. There’s something about strapping on a sports bra and tightening that bobble that just gets you in the zone for a some good old cardio. I do find however, that in a pony tail your hair can sometimes start to get damp underneath, as you are getting warmer. I like to adjust my hair throughout if I can, just to let some air in. Changing it from a bun to a pony tail is one solution, or taking the bobble out altogether at the end also helps. Thanks for reading, and let me know your gym tips for keeping your hair in tact!